As COP21 approaches, the Local Government Climate Roadmap (LGCR) is preparing to conclude its eight years of advocacy to recognize, engage and empower local and subnational governments as governmental stakeholders in the global climate regime. How did the LGCR’s journey begin? Despite the immense potential and power of local and subnational climate action, which has been developing since the early 1990s, neither the UN Framework Convention on Climate Change (UNFCCC) nor its Kyoto Protocol included any reference to local and subnational governments. When nations at the UN Bali Climate Change Conference (COP13) in 2007 decided to draft a climate regime that would look beyond mitigation and would include all countries, the LGCR was launched as a global advocacy movement to seize this opportunity for local and subnational governments. The LGCR argues that in order to ensure success in global efforts to reduce greenhouse gas (GHG) emissions and to adapt to the adverse effects of climate change, local and subnational governments must be fully recognized, engaged and supported in these efforts. The LGCR is facilitated by ICLEI – Local Governments for Sustainability in its capacity as the focal point of Local Governments and Municipal Authorities (LGMA) Constituency to the UNFCCC. When it was created, the LGMA had only a handful of members. The LGCR was therefore always kept open to networks who were not accredited to the UNFCCC as well. At COP15 in Copenhagen in 2009, the LGCR succeeded in mobilizing more than 1,200 representatives of cities and regions from around the world at the Local Government Climate Lounge. While nations were striving to agree on a global regime and to define binding commitments, the LGCR also released the Copenhagen World Catalogue of Local Commitments, capturing more than 3,000 voluntary targets worldwide. As such, Copenhagen was a clear demonstration of the success of the first phase of globally coordinated local action, with major milestones including the US Mayors Climate Protection Agreement in 2005 and the European Covenant of Mayors in 2008. A year later, in 2010, local governments accelerated their commitments through the adoption of the Mexico City Pact, which introduced global transparency and accountability of local commitments via voluntary reporting at the carbonn Cities Climate Registry. At COP16 in Cancun, this resulted in the first dialogue of mayors with the COP Presidency, as well as the adoption of the first COP decision that recognized local and subnational governments as governmental stakeholders. At COP17 in Durban in 2011, the concept of adaptation was cemented in the scope of local climate action thanks to the adoption of the Durban Adaptation Charter. Upon the opening of a new phase of negotiations through a new negotiating group (the ADP) with a mandate to conclude its work in 2015, LGCR partners met in Nantes in 2013 and agreed on their revised strategy. This included creating Friends of Cities at the UNFCCC, pushing for the adoption of a 10 Year Action Plan, conducting thematic technical studies and convening Ministerial-Mayoral dialogues. At COP19 in Warsaw in 2013, the ADP convened a workshop on urbanization and the COP Presidency hosted the first Cities and Subnationals Dialogue, gathering mayors and ministers from all geographies and scopes at a roundtable. These interactions resulted in the second COP decision recognizing the role of cities and subnational authorities in raising the global level of ambition in the pre-2020 period. 2014 was the most impressive year in terms of dialogues and initiatives, with the day-long sessions of the ADP Cities and Subnational Forum and Technical Expert Meeting on Urban Environment in June in Bonn; the outcomes of the 2014 UN Climate Summit, including the Compact of Mayors and the Compact of States and Regions, Cities Climate Finance leadership Alliance and the launch of the GEF Sustainable Cities Integrated Action Program in September in New York; and the launch of the NAZCA Platform at the COP20 in Lima. 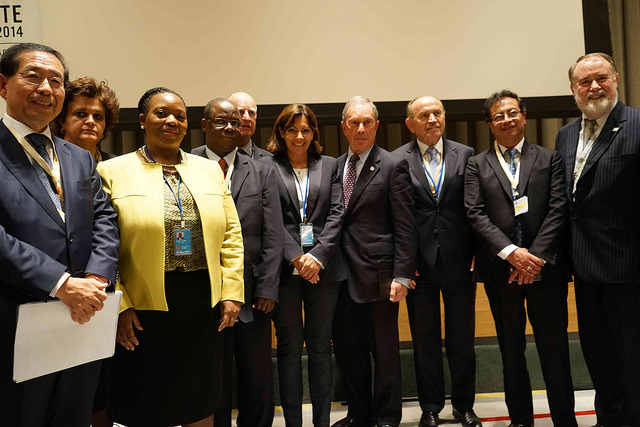 Launch of the Compact of Mayors at the UN Climate Summit in New York (c) ICLEI, 2014. Meanwhile, within the scope of post-2015 development agenda, significant progress was made outside of the UNFCCC process. This included the adoption of the Sustainable Development Goals, and in particular Goal 11 on sustainable cities; the acceleration of and support for local action in the Sendai Framework on Disaster Risk Reduction; a specific provision for financing municipal investments in the Addis Ababa Action Agenda for Financing for Development; and progress on the Nagoya 10 Year Framework for cities and subnationals on biodiversity. What Can Be Expected at COP21? At COP20 in Lima in 2014, nations agreed to unite within a bottom-up climate regime, with each country submitting their Intended Nationally Determined Contributions/Commitments (INDCs). However, the current INDCs are far below the level of ambition required to prevent global climate change reaching a point-of-no-return. An inclusive and ambitious climate agreement at COP21 in Paris is therefore an essential requirement for this new regime to be successful. The COP21 agreement will be seen as inclusive if it engages all non-Party stakeholders – in particular, local and subnational governments – as governmental stakeholders in global efforts and in the implementation of all outcomes. The adoption of relevant paragraphs in the draft text provides reason for optimism in this regard. However, an inclusive regime without the necessary ambition will resemble a bicycle without a chain. In Paris, nations must demonstrate their ambition by a) ensuring global greenhouse gas emissions peak before 2030 and aim for carbon neutrality or 100% renewables before 2050, b) developing a long term vision on adaptation to climate change, and c) creating a robust framework that addresses loss and damage from climate change. Through their voluntary commitments, enormous potential, committed networks and innovative partnerships, local and subnational governments are ready to accelerate action and raise ambitions globally. In the past, nations have missed the opportunity to fully tap this potential. They must not repeat this mistake in Paris, as it is very likely that we will not have a fourth opportunity. For more information please visit the LGCR website.